A Lighted Fiberglass Fountain. Use Inside or Out! Stuff Points: Earn 465 points when you buy this stuff. 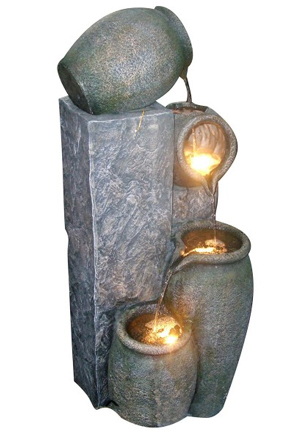 This lighted fiberglass fountain will add charm and interest anywhere you place it. Made entirely from fiberglass, this model has a natural look like real stone, but is much lighter and less expensive. Despite being easy to move, this fountain is quite durable and will be a long lasting piece that generates relaxing sounds to set the mood in your backyard, or out on your deck or patio. Set up is simple, and there are no complicated steps, intricate parts, or much to assemble at all. All you need is a standard plug outlet or extension cord and regular old tap water to begin enjoying this great water feature. It comes complete with everything you need, and it's size and weight make it ideal to place just about anywhere. It is tough enough for use outside, but would also make a great indoor fountain too if you have the right space. Since it is totally self contained, you can operate it just as well indoors or out. Water will pump up to the top pitcher and fill the space inside. Once full, the water will stream out to fill the pitcher laying on it's side below it. Once this one is full, water begins to cascade out the opening to form a small waterfall that falls down to fill the third pitcher. This taller pitcher will fill up and then pour into the last one which is even lower. Once the journey is complete, the water will continue to cycle over and over again creating an endless amount of natural running water sounds. You get a good amount of water noise with this unit, so it will really set the mood and block out background noises in the area where you place it. Each pitcher is lit from within by a clear halogen bulb to further enhance the look of this model. Rugged and natural looking, this garden fountain will blend well with any landscaping, and the color will match existing decor and foliage. Turn your outdoor space into the relaxing sanctuary you always wanted with this high quality fiberglass fountain. Order Yours Today! Pouring Pitchers Multi-Tier Fountain - A high quality outdoor fountain made from fiberglass resin. Perfect for any space outdoors or in!Order Yours Today!